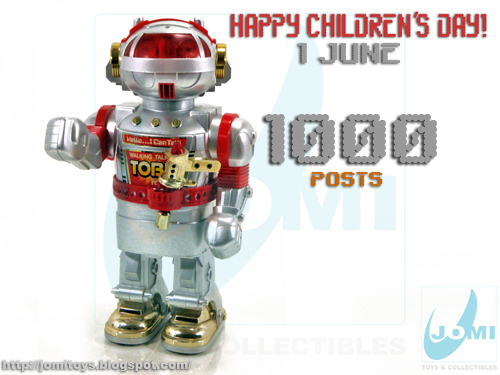 JoMi toys - under maintenance : Happy Children´s Day and 1000 posts Milestone! It couldn´t be more perfect, 1000 posts on 1 June. 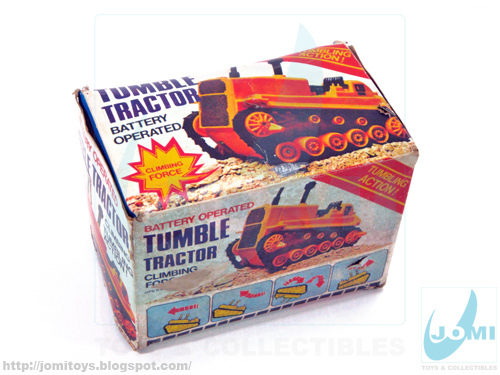 Presenting some of the toys many consider to be "real" toys. Bump N Go memories of fun, lights and sound of the old days (loud and clear). Just a small preview of some of future reviews of our childhood´s real classics! Toby, the walking and talking robot from 1986, with smoke system! Half "Rambo" riding his Hero Tank (Wild-6). "K.I.T.T." 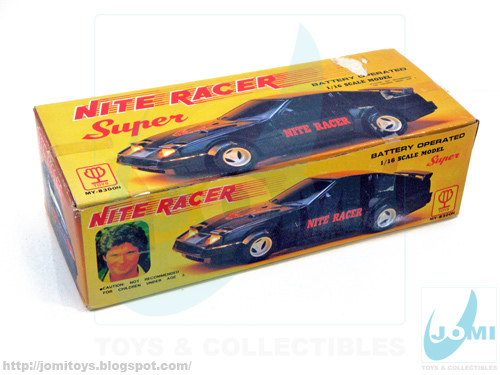 1/16 scale Nite Racer. Tumble Tractor with treads of amazing resemblance to G.I.Joe´s Cobra H.I.S.S. Strong and and working too! Remember the sonic controlled R/C cars? 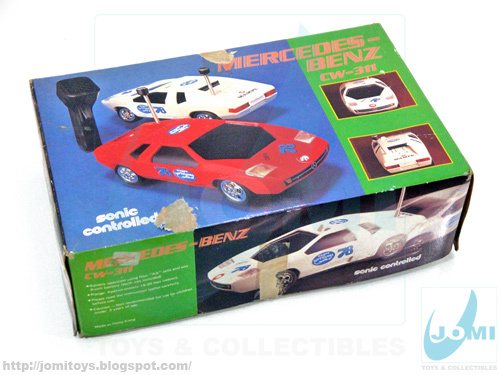 Here´s a CW-311 Mercedes-Benz! 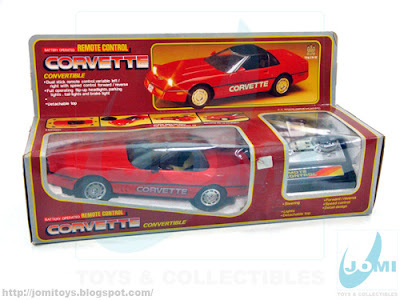 Toy State´s Dual Stick R/C Corvette, wire, not radio! Early 80´s style. And how about a buttons-only 4 functions (4-way) R/C, with hinged headlamps? 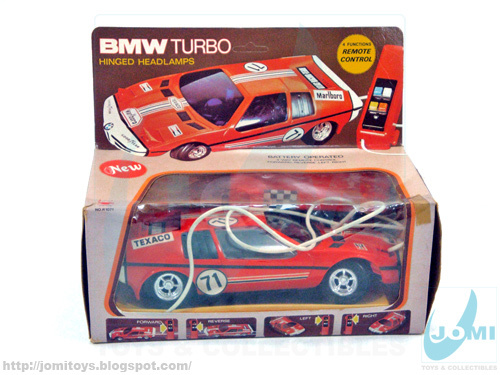 BMW Turbo. 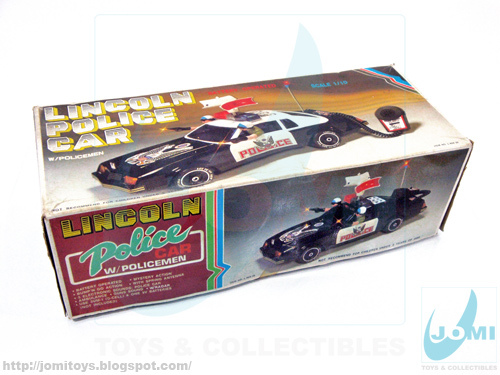 A gigantic 1/10 Lincoln Police Car. With working microphone! And talking about gigantic, a real beast! 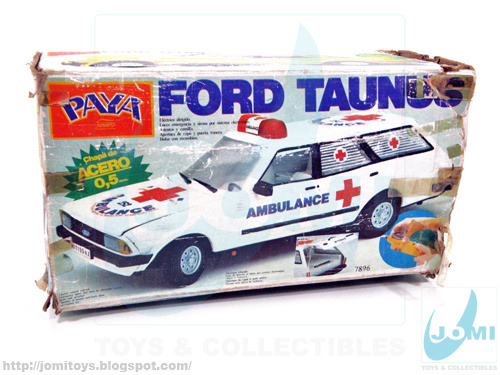 A Ford Taurus ambulance. Heavy... really (thick steel) heavy. Paya´s 0.5mm steel construction. 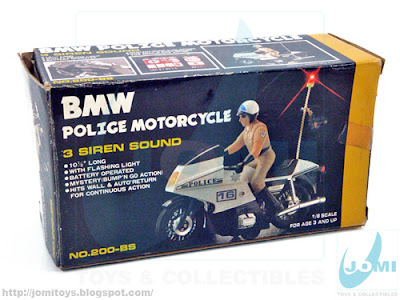 Amazing siren sounds! Late 70s Police Car. Back when they´d draw boxes, no photos. Dome lights and alarm sounds. Emergency Team ambulance, tin made. 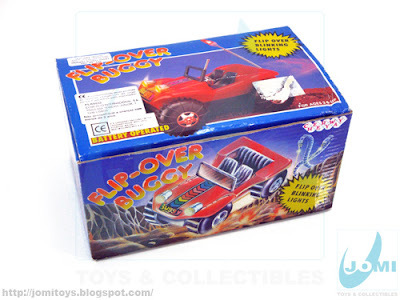 And how many of you remember these Flip-Over Buggy toys? These things could almost climb walls!!! Enough about cars, the police bikes! 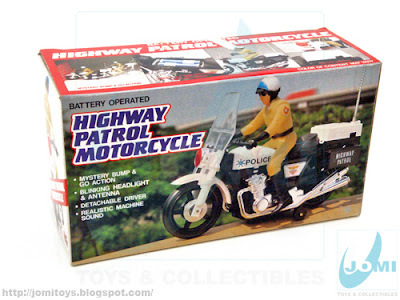 Highway Patrol Motorcycle with detachable driver. In the same style, the BMW Police Motorcycle, 1/8 scale. 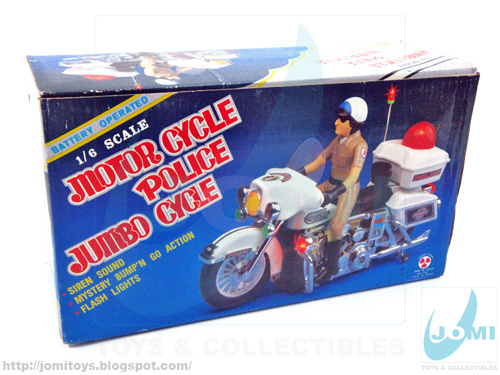 And a really big one, 1/6 Police Jumbo Cycle. All of these will have their spotlight here, and if any of you have a particular interest in that future review of any particular toy becoming closer in time, just let me know and I´ll make sure it´s sooner than later. All of these had their time and had a part in the past childhood of so many of us. I´ll be glad to show it again. 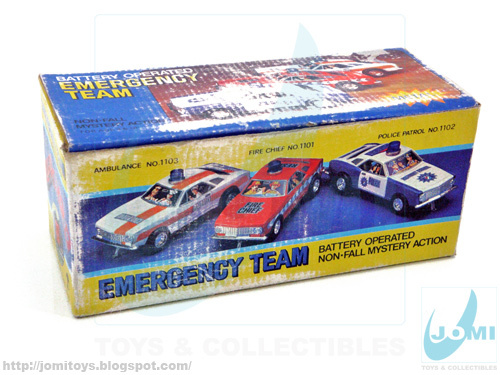 And of course, many action figures to come too. And other vintage and modern classics! Enjoy your children´s day. All of you! Thanks jboypacman! And thanks for being part of it with your comments and thoughts. 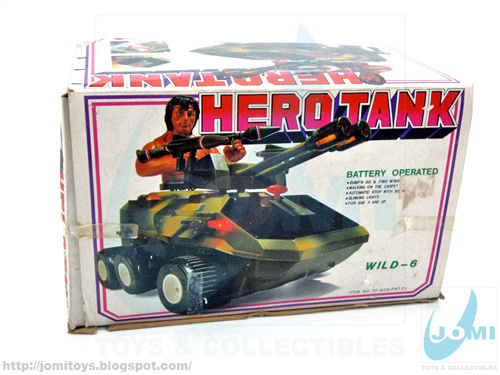 Herotank and Nite Racer on their way! good old walking smoking robots .I didn't realize that I kind of miss those guys until I saw that pic.I had a gold one that didn't even make it to be a year old but he was great fun while he lasted. 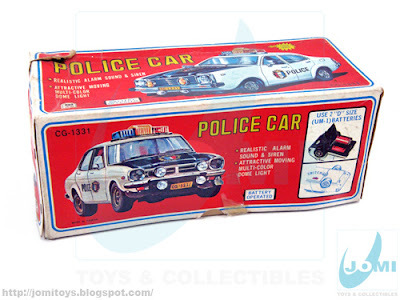 Which I can buy the Lincoln Police Car???? Como puedo hacer para comprar la Patrulla Lincoln?? ?Me interesa mucho, soy de Mexico. About the Lincoln and pretty much any other item, send an email: jomitoys@gmail.com with your contact and address to calculate shipping price.